A performance tire for the road and on the track. 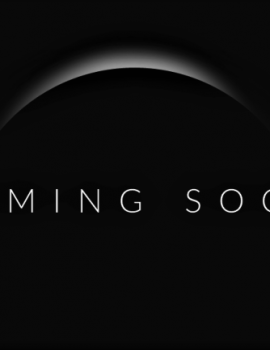 Made with the most modern design technology developed by Pirelli, a multi compound tire, with three zones at the rear capable of optimizing the area of contact. Maximum performance on the track, and great on the road for incredible control of the bike in all situations. A tread with an aggressive pattern, in line with the Rosso style. 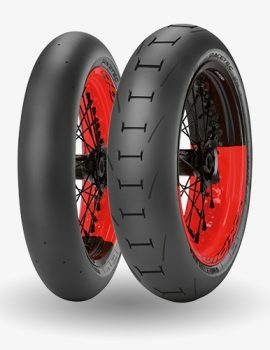 Diablo Rosso Corsa tires stem from WSBK racing. It is engineered to deliver the optimal forces to the contact patch area. The footprint area is larger with all available horsepower transmitted to the ground. 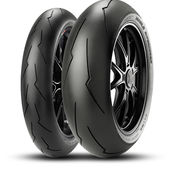 Using ideal contour shaping technology, and integration of the handcrafted care of Pirelli engineers with the support of sophisticated computer modeling systems, the Diablo Rosso Corsa provides support at lean and in cornering exits at full throttle. With the latest generation super sport compound. 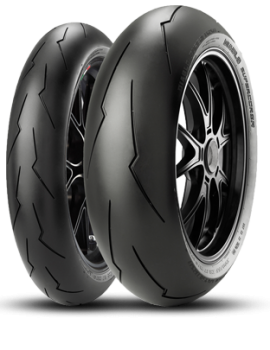 The Diablo Rosso Corsa delivers great grip in a wide range of temperatures and applications under typical street riding conditions. 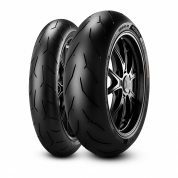 Thanks to the WSBK derived compound, grip is assured in severe track riding conditions at high lean angles for impressive power transmission to the ground. Contour Shaping technology guarantees a quick and reactive ride, reassuring contact feeling and precision cornering. The Diablo Rosso Corsa ensures maximum confidence even in quick direction change. New reinforcement chemicals and a new curing system allow the Diablo Rosso Corsa to preserve performance characteristics like drainage, stability and grip. The Diablo Rosso Corsa provides quick warm up and consistent performance lap after lap, combined with excellent recovery after stop and go. Thanks to the functional groove design the Diablo Rosso Corsa provides best in class wet performance.